I was up in NJ/NY for the weekend, and Amy and I checked out The Cloisters, the Met’s medieval art branch in Fort Tryon Park, Upper Manhattan. Being medieval art and history enthusiasts, we were fairly impressed with the collection at The Cloisters: artifacts and architecture from 11th to 16th Century Europe, all well-preserved and labeled. I was especially impressed with the Rosary Bead, large for a bead, but tiny for such an intricate work of sculpture. The Cloisters photoset. Photos were taken by both me and Amy, as we were sharing her Powershot S230. 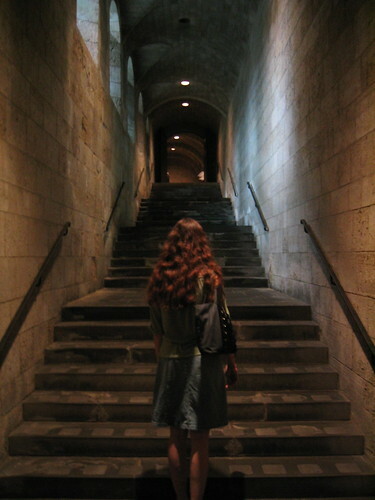 More from JCSparks, one of Amy’s classmates, via whom I first learned about The Cloisters. You can get to Fort Tryon Park and The Cloisters by taking the A Train up to 190th Street. After you get out of the elevator and the station, turn right and walk through the park, or take the M4 Bus. Previous post: Deep Impact at Tempel 1: Nought But Dust? i’ve never been to this place. my friends told me it’s a site to visit. will go one day.